Manhunt: Unabomber is an American drama miniseries created by Andrew Sodroski, Jim Clemente, and Tony Gittelson, starring Sam Worthington and Paul Bettany. It depicts a fictionalized account of the FBI's hunt for the Unabomber and premiered on Discovery Channel on August 1, 2017. On July 17, 2018, it was reported that Charter Communications was in advanced negotiations with the series' producers to pick up the series, now considered an anthology series, for two seasons to be aired on their Spectrum cable service. The first of these potential seasons reportedly would follow Eric Rudolph, known as the Olympic Park Bomber. The working title for the series was Manifesto, and the series order was announced in March 2016 at a presentation by Discovery Communications president Rich Ross. On May 15, 2016, Entertainment Weekly released several promotional photos, showing a first look at Paul Bettany's portrayal of Ted Kaczynski. Lionsgate Home Entertainment released the entire miniseries on Blu-ray and DVD on December 26, 2017. Netflix secured the rights to the series in November 2017. It premiered on the site on December 12, 2017 in various territories. The review aggregator website Rotten Tomatoes reported a 93% approval rating, with an average rating of 7.67/10 based on 28 reviews. Greg Stejskal, a former FBI agent who was involved in the UNABOM investigation, criticized the writers of the show in TheWrap. He accused them of making "a minor member" of the FBI investigative team "into the star player who won the game", referring to the show's portrayal of Jim Fitzgerald. He said that Fitzgerald never met Kaczynski, was not in Lincoln, Montana, during the time of Kaczynski's arrest, had no part in the search of Kaczynski's cabin, and never interviewed him. Fitzgerald told Bustle in August 2017 that the show is in the "high 80 percentile" of accuracy, though "the Fitz character is a composite". He also stated that he had not interviewed Kaczynski, although he said he was on his way to do so in 2007 when Kaczynski changed his mind. ^ Hipes, Patrick (2017-03-28). "'Manhunt: Unabomber' Premiere Date Set On Discovery Channel". Deadline. Retrieved 2017-07-31. ^ Pedersen, Erik (2017-06-05). "[Watch] 'Manhunt: Unabomber' Trailer: FBI Profiler Hunts Unusual Serial Killer". Deadline. Retrieved 2017-07-31. ^ Andreeva, Nellie (July 17, 2018). "'Manhunt' Anthology Series Nears 2-Season Pickup At Charter From Lionsgate With Eric Rudolph As Next Subject". Deadline. Retrieved July 17, 2018. ^ a b Welch, Alex (2017-08-02). "Tuesday cable ratings: 'Manhunt: Unabomber' premieres, 'WWE Smackdown' holds steady". TV by the Numbers. Retrieved 2017-08-07. ^ Welch, Alex (2017-08-09). "Tuesday cable ratings: 'WWE Smackdown' holds steady, 'Manhunt: Unabomber' dips". TV by the Numbers. Retrieved 2017-08-13. ^ "UPDATED: SHOWBUZZDAILY's Top 150 Tuesday Cable Originals & Network Finals: 8.15.2017". Showbuzz Daily. 2017-08-16. Retrieved 2017-08-21. ^ "UPDATED: SHOWBUZZDAILY's Top 150 Tuesday Cable Originals & Network Finals: 8.22.2017". Showbuzz Daily. 2017-08-23. Retrieved 2017-08-29. ^ "UPDATED: SHOWBUZZDAILY's Top 150 Tuesday Cable Originals & Network Finals: 8.29.2017". Showbuzz Daily. 2017-08-29. Retrieved 2017-09-03. ^ "UPDATED: SHOWBUZZDAILY's Top 150 Tuesday Cable Originals & Network Finals: 9.5.2017". Showbuzz Daily. 2017-09-07. Retrieved 2017-09-10. ^ Porter, Rick (2017-09-14). "Tuesday cable ratings: 'American Horror Story' takes a hit in week 2". Tvbythenumbers. Retrieved 2017-09-19. ^ Wagmeister, Elizabeth (March 31, 2016). "Kevin Spacey, Dana Brunetti FBI drama 'Manifesto' lands series order at Discovery Channel". Variety. Retrieved November 4, 2017. ^ Snierson, Dan (May 15, 2016). "See Paul Bettany as the Unabomber in new Discovery series". Entertainment Weekly. Retrieved December 4, 2017. 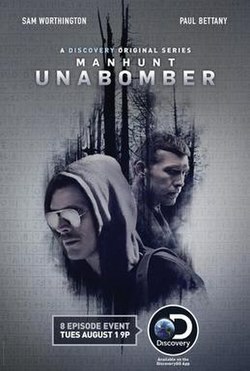 ^ "Manhunt: Unabomber (mini-series) - Lionsgate's Press Brief Reveals Bonus Material for the DVDs and Blu-rays". tvshowsondvd.com. Archived from the original on 2017-10-28. Retrieved 2017-10-23. ^ "Manhunt: Unabomber (2017)". Rotten Tomatoes. Retrieved February 28, 2019. ^ "An FBI Veteran on What Discovery's 'Manhunter: Unabomber' Gets Wrong (Guest Blog)". TheWrap. 2017-08-15. Retrieved 2017-08-17. ^ Stejskal, Greg (August 15, 2017). "An FBI Veteran on What Discovery's 'Manhunter: Unabomber' Gets Wrong (Guest Blog)". Houston Chronicle. ^ "Ex-FBI Agent: 'Manhunt Unabomber' Series Disrespects Heroes". www.deadlinedetroit.com. Retrieved 2017-08-17. ^ Urquhart-White, Alaina. "How Accurate Is Fitz In 'Manhunt: Unabomber'? Here's What The Real James Fitzgerald Thinks Of His Fictionalized Self". Bustle. Retrieved 2017-08-18.